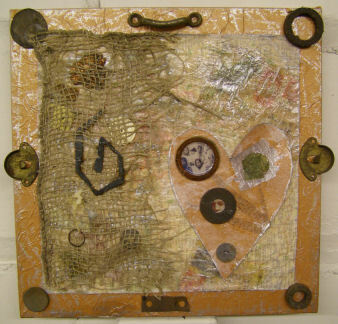 This mixed media collage is assembled on a 12x 12 inch gallery wrapped canvas with finished sides. It includes layer upon layer of vintage paper, paint, ink, text, photos, metal, and fiber. It invokes the history of my ancestors journey to this country, and it inclues symbols of the uniqe journeys that each of us make in our lives. Photographing this piece was a challenge, as it was almost impossible to capture the texture and color.